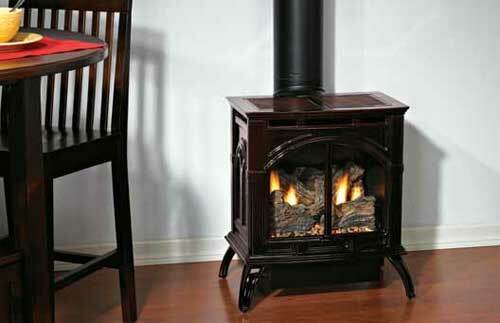 Our medium stoves are rated at 25,000 Btu and stand just over three feet tall. The richly detailed casting features fully operable decorative cast iron doors on durable lift-pin hinges that swing open 180 degrees. Choose from five finishes - porcelain black, porcelain mahogany, porcelain sand, matte black, and matte pewter. 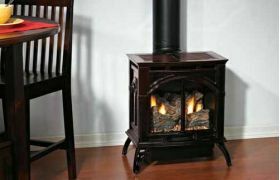 Each of our porcelain stoves starts with a hand-applied pigment and glass mixture that's oven fired to 1,500 degrees Fahrenheit to produce a rich durable finish that both softens and highlights edges. Our porcelain finishes capture and reflect room light for exceptional visual interest. The porcelain mahogany finish features light and dark accents, for added visual interest.